The overnight starter for the bread is called a Tangzhong (water roux). It is made by whisking 5 parts water with one part flour over medium heat until the mixture thickens and is 65C. This is how it looked after sitting on the counter overnight (it looked pretty much the same directly after being made). I was amazed at how easy it was to prepare AND how easy it was to remove from the bowl to add to the rest of the bread dough ingredients. 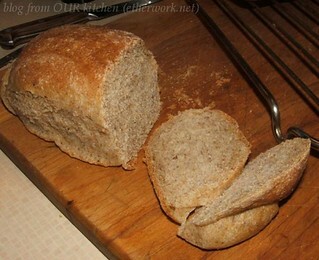 Here is the bread just after being shaped. Here is the bread just after being removed from the oven. It slipped right out of the pans. It looked and tasted fine inside though.